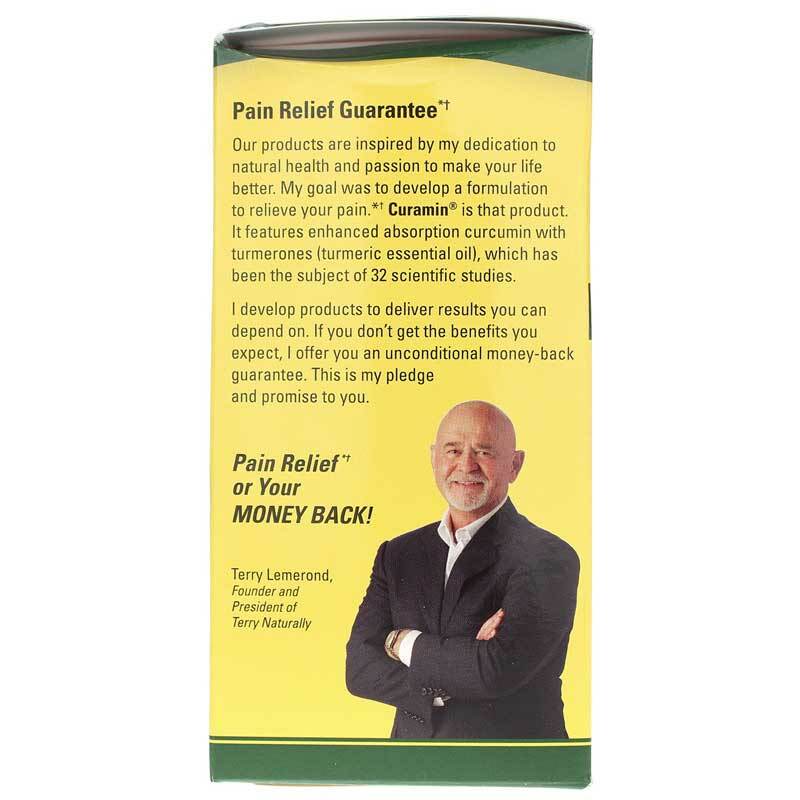 Curamin from Terry Naturally is a curcumin (turmeric) supplement that seeks to support pain relief with four natural ingredients. Turmeric has been used in the Ayurvedic tradition for many years to support the temporary relief of pain, and has also become popular as a supplement. 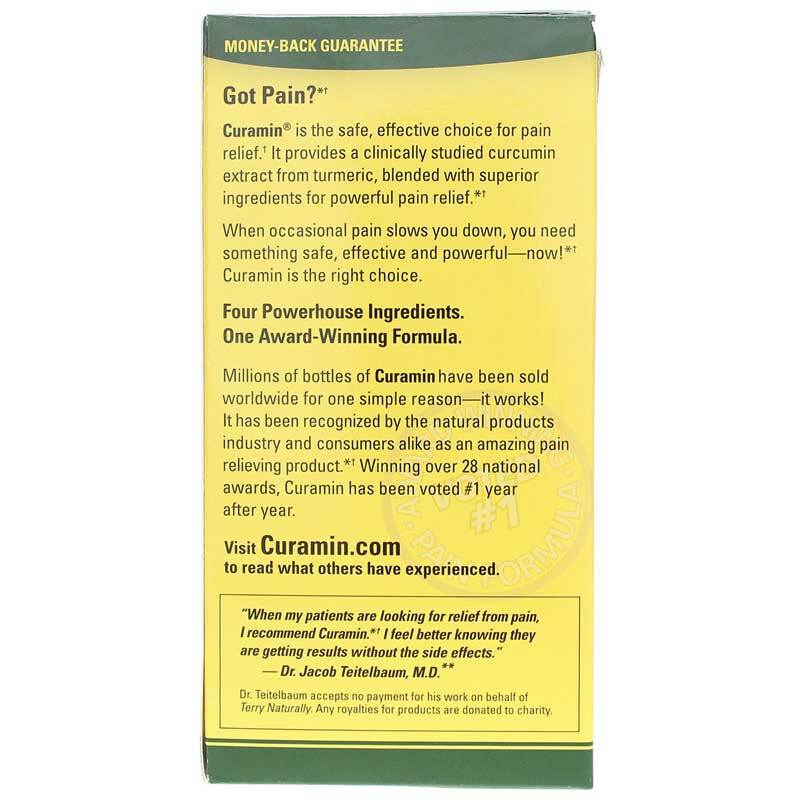 Curamin includes a form of curcumin called BCM-95, which studies show yields superior results on pain relief in muscles and joints. 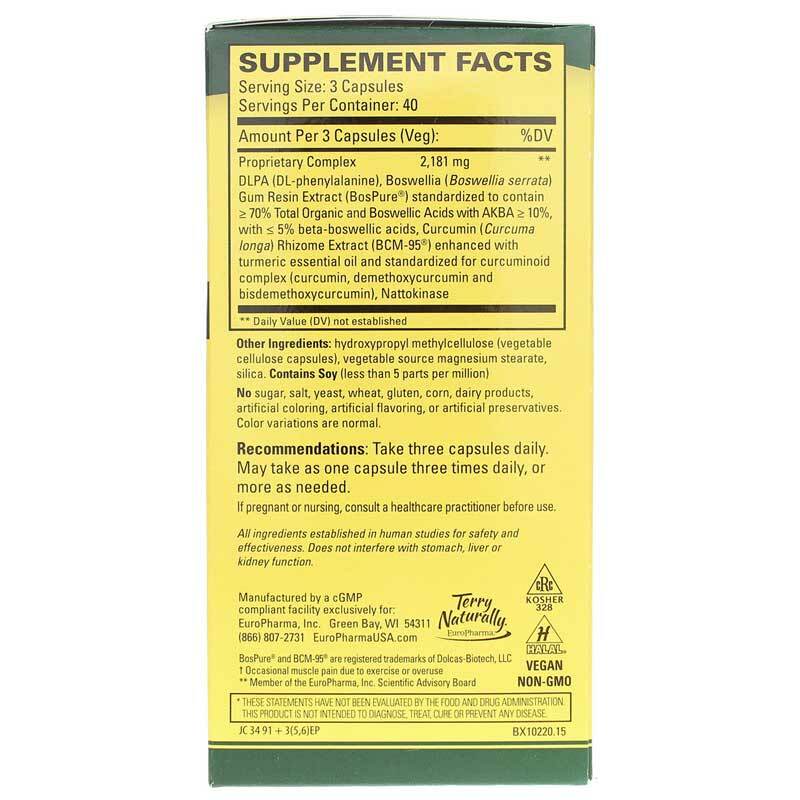 Curamin is also a bioavailable form of curcumin, which means it is easily absorbed. This formula also includes boswellia serrata, DLPA, and nattokinase, which support joint health, a healthy mood, and more. See the difference Curamin could make for you. 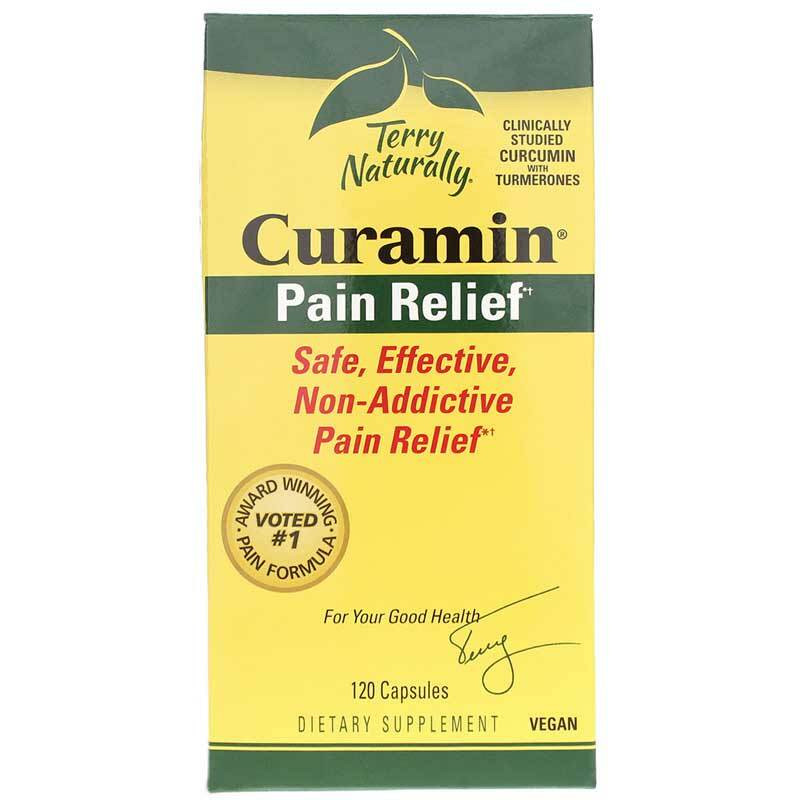 Order Curamin from Terry Naturally online here. Other Ingredients: hydroxypropyl methylcellulose (vegetable cellulose capsules), vegetable source magnesium stearate and silicon dioxide. Contains NO: sugar, salt, yeast, wheat, gluten, corn, dairy products, artificial coloring, artificial flavoring or preservatives. It contains only natural ingredients. Color variations are normal. Adults: Take 3 capsules daily, or as needed. May take as one capsule, three times daily. Always look forward to receiving Curamin so do not run out. I take two Curamin pills a day and it totally controls my pain. I don't like the price but I cannot take regular pain meds because they will tear up your liver. This stuff works like a champ. It takes about a month to get in your system but then the pain disappears and it is totally worth it. This site here is the cheapest to buy from, trust me I have been on the stuff for 3 years now and it is an awesome site plus quick shipping, like if you run out they get it to you in the same week. My legs are much better with a lot less pain when I take Curamin. So far I have not felt the benefits to alleviate my pain and will not reorder. Great product if you can afford it. So far, they seem to be working. So far, so good. I did not give this 5 stars because of the cost and I've only been taking them a week. My chiropractor told me about this supplement 4 years ago and although expensive,I have learned that it is a top necessity needed for my lifestyle. I am a 64 year old lover of horses who rides avidly and cannot do without it. Curamin is a miracle. If you have pain,you must try it. This is the most reasonable site that i have found for Curamin. The blend of ingredients in this is a perfect. Curamin seems to help the joints in my wrists. Blend seems to effective. I would recommend this product. I have been taking Curcumin for the last 18 months and am feeling better every day! I purchased this after reading a blog. I found that by using the Curamin 3 times a day my irritaion is just about gone. I continue to walk each day and feel great. I take two a day. I have tried the bracelet with the majic magnets and it did not work as good as this stuff. It took about a month to get in my system, and only about 4 days to wear off. I quit taking it in an effort to give the bracelet a chance and man was i sorry. Sent the bracelet back and bought more Terrys naturally. Did not notice any difference. Possibly not taking enough or long enough. Curamin was recommended by a friend. I was pleasantly surprised because it actually works. I highly recommend it . Received within three to four days. Wife has used curamin for a couple of years with good results. I've been taking Curcamin for a week. My experience with Curmin leaves me ambivalent about its effectiveness. Have been taking this product pretty regularly for about a year now. Started working immediately for me. Try to take one daily, however, sometimes I forget for a period of time. When I do forget I notice the difference.Have recommended this product to friends who have also benefitted by this product.One of my husband's customers originally recommended the Curamin. Now I pass the word along to my friends. Based on my own experience, I highly recommend this product. I have been taken this for six months now my Acupuncturist suggested that I give this a try. This works for me but you do need to take it everyday. I have taken Curamin for over a year and have been happy with its results. I take 1 capsule on a daily basis with my regular daily vitamins. .